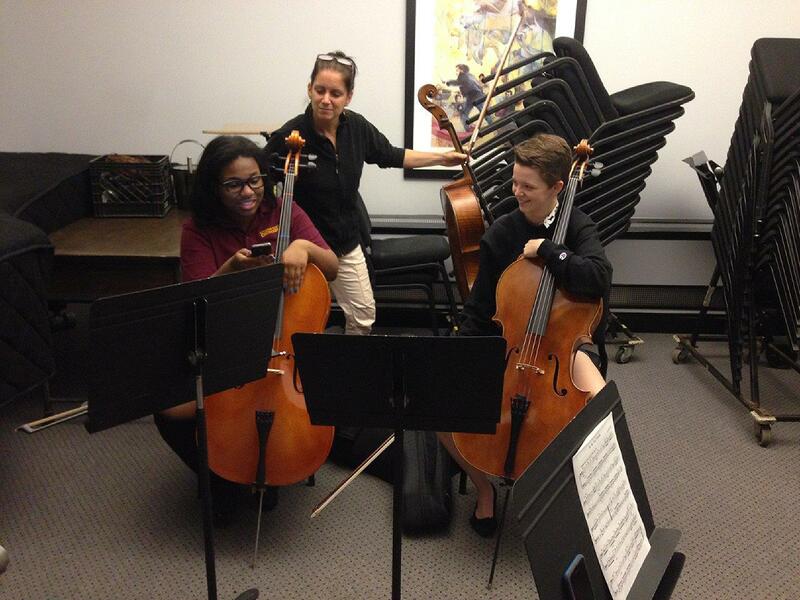 In March St. Louis Symphony Youth Orchestra cellist Julie Holzen wrote a Playbill article about her experience as a musical mentor to Tieryn Minor, a freshman at Lutheran North High School and a member of an IN UNISON Church. Holzen and Minor practiced together. Holzen shared her knowledge, experience and enthusiasm. Minor took the stage with the YO in rehearsals and performed on the February On Stage at Powell Concert. You can read Julie’s article here, which gives her insights into the first year pilot of the YO’s Mentoring the Music: Peer-to-Peer program. Julie is going on to her first semester at Oberlin this fall. She, Tieryn, and STL Symphony Associate Principal Cello Melissa Brooks got together for some work in the Powell Hall Green Room the other day. Afterward, Melissa was effusive about the program and about Tieryn’s music-making. Tieryn’s eager for her next YO Peer-to-Peer Mentor in the coming season. You get people who care about people and who care about music, put them together, you find stories to live on.